Mont Blanc, east face. 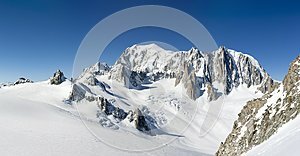 Extra-large panorama of Mont Blanc Massif peaks and glaciers in a sunny winter day. From left the italian border with Pointe Helbronner cable-car station, Gèant Glacier, la Tour Ronde, Mont Blanc summit, Mont Maudit, Mont Blanc di Tacul. Chamonix, France, Europe.